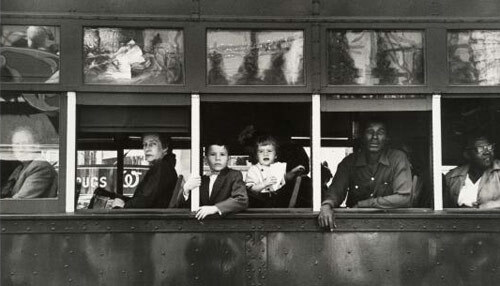 Robert Frank’s masterpiece, The Americans, was first published fifty years ago in the US. The Metropolitan Museum of Art in New York is observing the anniversary with an exhibition of all the images from the book, plus other photos, contact sheets and a short film by Frank. The Americans contains 83 photographs made on road trips across the country. Looking at America, Frank took in things others had seen but failed to note. Some were banal: jukeboxes, the ubiquity of flags, the many manifestations of automotive culture. Other elements – vaguer, abstract, even sinister – were anything but banal: a sense of isolation, the place of African-Americans in US society, a tension between openness and confinement. The latter is evident in everything from the sweep of a Southwestern landscape to the flickering image on a TV screen. It’s a beautiful book, and many of its themes will still resonate with viewers 50 years later. The exhibit will be up at the Met through January third. I’ll be making a trip to NYC at the beginning of the year and I’m looking forward to seeing them all in person.